Sierra Leone, Kosovo, East Timor, the Bronx. The nightly news brings vivid images into our homes of the mistreatment of people all over the world. In the secure comfort of our living rooms, we may feel sympathetic to the victims of these atrocities but far removed from them. “What does all this have to do with a person in east Tennessee?” is the question, from a radio program host, that prompted William Schulz to write this book. Schulz provides answers with an insightful work, generously laced with compelling stories of women and men from all continents, which clearly delineates the connection between our prosperity here in the United States and human rights violations throughout the globe. The book reveals the high cost of indifference not only in ethical and moral terms, but in terms of the political, economic, environmental and public health consequences in our own backyards. Consider, for example, the high cost to U.S. military personnel and their families of radical political instability in the Balkans-costs that might well have been avoided if the United States and the international community had conscientiously defended human rights. Or the devastating economic impact on U.S. businesses of systemic corruption in Asia. Or the serious environmental hazards of nuclear fuel leaks in Russia, the spread of drug-resistant tuberculosis, and the expensive dangers of inhumane prison conditions in the United States, to name just a few examples. At the heart of each of these problems lies the abuse of basic human rights. Through the stories of Natasa Kandic and Alexander Nikitin, of Samia Sarwar and Han Dongfang, of Jaime Garzon and Sister Dianna Ortiz, Schulz introduces us to the front line of the international battle for rights and builds a powerful case for defending our own interests by vigorously defending the human rights of people everywhere. "If any foreign policy primer could be called a page-turner, it is this one by the executive director of Amnesty International USA. What the human rights community needs to do, argues Schulz in this well-written clarion call, is find 'the compelling reasons why respect for human rights is in the best interests of the United States.' . . . Schulz has written a clear and provocative book that should be read by all concerned with human rights and U.S. foreign policy and will draw new supporters among the general public." 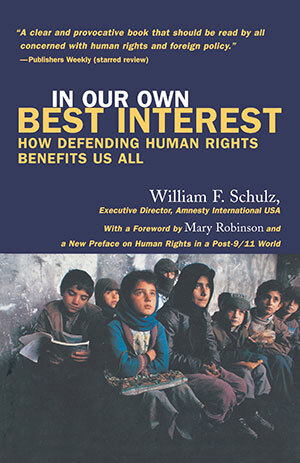 "In such a climate, William F. Schulz, a former UUA president and current executive director of Amnesty International USA, has written a smart, detailed and compelling book about the urgency of the human rights movement. In Our Own Best Interest: How Defending Human Rights Benefits All Americans strikes at the core of existing notions of national self-interest by making the case that if we value our own lives and futures, we will pay serious attention to upholding human rights everywhere on earth. . . . In writing In Our Own Best Interests, Schulz has given new life and strength to the reality of our interdependence."